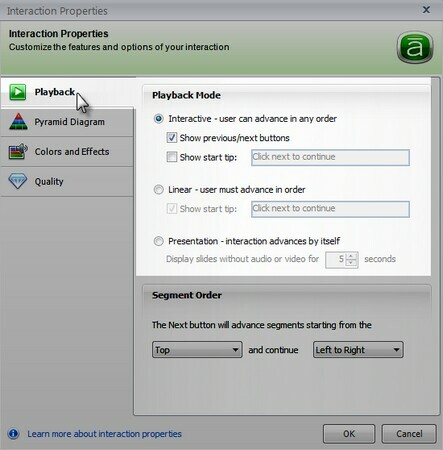 Engage ’09 enables you to change your interaction's playback mode with one quick and easy tweak in the Interaction Properties. This is cool, because if you're creating content in which the steps or segments build on one another, you don't want learners clicking around willy-nilly. On the other hand, if you're creating content that can be experienced in any order—such as as Glossary interaction—you'll want to allow learners to jump to any part of your interaction, any time, without restriction. First, open your interaction in Engage and click Interaction Properties. Click Playback. In any interaction you create, you'll have three playback choices, spotlighted here. Choose whichever option makes the most sense. Choose Interactive to make the learner master & commander of their own navigation. If they want to jump back to the same step or segment 85 times, nothing's stopping them. If they want to skip over half the interaction, they can do that too. Show previous/next buttons enables navigation in the upper-right corner when your interaction plays. Users can click these to move through the interaction in a linear order if they want. Of course, they can still click on any step or segment in the interaction if they prefer to jump around. Show start tip pops up a little hint pointing to the next button if the user doesn't click anything within five seconds of the interaction beginning. Enter whatever text you want for the tip. Note: Interactive playback isn't available for Media Tour and Guided Image interactions. Those, by design, take users through the interaction in a set order. Choose Presentation if you want the interaction to advance on its own, step-by-step, in order, with no user controls available. Each step will display for as long as it takes to play any audio or video you've inserted in that step. Or, if there's no audio or video, the step will stay onscreen for the amount of time you specify here.